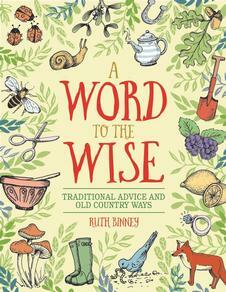 A Word to the Wise is a fascinating compilation of many of the old adages that our grandparents believed in. Some have since been proved true, although others, like putting butter on a burn, have been discredited. But it is probably no accident that many once-valuable items such as salt, eggs and silver recur in the old sayings. In the days when most people made their living from the land, being in tune with nature could be vital to survival. For the superstitious, there are dozens of old country sayings and traditions that relate to good luck, good health and finding a spouse, as well as to omens of disease, death and disaster. Almost everything was once invested with significance, from seeing a single magpie to the day of the week on which you did your washing or cut your nails.